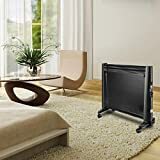 ☀Three-folded Panel Heater: Three-dimensional surround, fast heating, more concentrated heating range, no need to take off your shoes. Warm your feet, legs and knees gently. Perfect for home or office. ☀SAFETY: Automatic shut-off when it overheats(70℃)/ 45° dumping/ continuous heating for 3 hours to avoiding unnecessary accidents and reducing the risk of fire. ☀EASY TO USE: Adjustable thermostat, simple on/off switch and 3 working modes make this panel heater a versatile, energy efficient solution for cold winter months. ☀IDEAL HEATER: The surface of the Non-woven fabric is touchable, so children or pets can avoid any scald. Carbon Crystal films makes it heating up evenly and keeps temperature persistently. Silent Operation, no installation required. Three-folded design makes it easy to store and convenient to carry. ☀CUSTOMER SERVICE: 30-days money back guarantee, 12-month replacement warranty guarantee. If anything happens to your device within the 1 year warranty period, free to contact us. ➤ This energy-efficient heater is three-dimensional surround, Ideal for quickly heating up small areas both around the home or in the office. Suitable for under-desk heating to warm your feet and knee. ➤ The heater also benefits from low wattage with rapid heat up - for extremely economical use. ➤ Silent Operation, no noise. No worry about it will disturb your sleep and rest. No dust movement, ideal for allergy sufferers. ➤ Easy to use - simply plug in and press the button. ➤ Come with a small blanket(70*110cm) to keep temperature. 1. Please read the instruction sheet carefully before use. 2. Please do not use it on a wet floor or on the ground. Turn off power when the surface got wet. Use it after completely dry. 3. When not in use, please turn off the thermostat power switch or unplug the power plug. 4. Far away from fire .Don't use it with other heating device. 5. 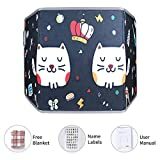 Turn off the heater and disconnect the power when no use. 6. Keep it at shady and dry place for storage. Adopt modern perfect design, mature heating technology to provide comfortable and warm environment for you easily and conveniently. Instantaneous heating, low noise, low energy consumption and maximum heating power of 1500 watts. 1500W and 700W of two high and low thermostat controller can meet your heating needs. Equipped with handles and pulleys for easy handling and movement. Easy to install, the bottom of both sides of the landing pulley design is strong enough to facilitate movement, pulley removal convenience. Homeleader is well-known in the manufacturing and distribution of kitchen household appliances in many countries, providing optimal products aimed at satisfying our daily-life indoor and outdoor. In recent years, homeleader has grown into an international company whose main line is designing and manufacturing more good products used in our daily-life. In addition, Homeleader covers a wide range of products such as appliances in the kitchen and heaters in the bedroom. 1.The pulley base is correctly installed through the two mounting interfaces at the bottom of the heater. 2.Fixed power through two 700 watt and 1500 Watt switches. 3.The temperature is regulated by rotating the thermostat. 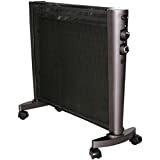 This Bionaire Micathermic Console Heater offers a slender design, this heater does not take up a lot of space and heats up quickly. Heats through the process of convection. The micathermic heating panels are made of the mineral mica, which resists breakdown and has excellent stability. Adjustable thermostat control and heat mode setting let you set the heat just right for you. This lightweight home heater is virtually silent during operation and provides steady heat that's ideal for larger rooms. Fully Assembled - allows you to take the heater out of the box and have it working in minutes. Simply plug the heater into a wall outlet, adjust the thermostat, and enjoy the warmth from your new Lasko space heater. Lasko’s silent room heaters use natural convection to circulate warm air silently throughout your room. The low-profile design makes it blend into your existing decor. Features digital display, adjustable thermostat, and timer functions.